So thank-you President Obama. I am not upset with your instructions to the American UN ambassador to abstain. I am not upset by the fact that you were probably instrumental in the preparation of the resolution (according to Alan Dershowitz). Quite the contrary. 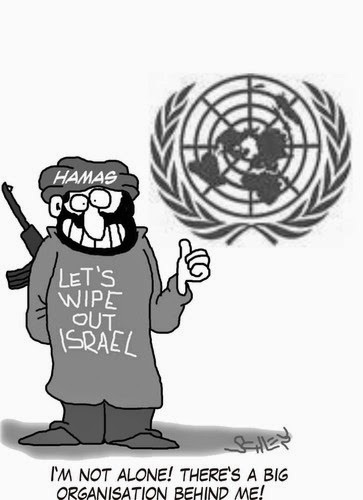 I am glad that you allowed the UN to shine once more in its aura of duplicity and stupidity. Next McCully secures shameful legacy for New Zealand at UNSC. 1. Obama: I have already taken my shower and cleaned my teeth, so I will not even mention the name of the Jew Hater who, fortunately will be leaving the White House soon, unfortunately 8 years too late, lest I have to repeat my going-to-bed routine since “mud sticks”. 2. What is wrong with New Zealand? I had been under the impression that their Prime Minister was a decent man? Murray McCully…their FM ran/runs NZ….a sick attack dog of no real committed, extreme political hue….just a grub of a human being, who relishes playing factional party politics – and who had his foot firmly planted over ‘mild mannered’ Key’s throat. I hazard at my own guess, that this was the principal reason for Key’s recent resignation. He’d had enough of it! Why?….Same Party, ‘in house’ politics…..similar as that encouraged, and practised by our smarmy Wentworth Waffler. McCully went to a lot of trouble obliging Obama with this vote…to the extent Kerry; three odd weeks back, flew half way around the world….21 hours flying time, to have a day and a half in NZ imbibing in Iced Vo Vo’s and Earl GreyTea with Kerry…as they stitched up Israel’s fate. Why? Who would know…all countries have a compliment of lowlifes within their governance structure! It was a very productive round the world trip for Kerry….dropping off in Venezuela on his way back to the good old USofA… to ensure he also had their vote padded down …more Iced Vo Vo’s all around no doubt. Obviously Bibi doesn’t read Jews Down Under, for I recounted this same information the very next day after Kerry had arrived in NZ. Bibi got side tracked doing deals with Sisi, when he should have been sending a pallet load of Iced Vo Vo’s to Murray Mc in the land of a million ewes…..
Murray Mc loves Iced Vo Vo’s…. NZ has a new PM as yet untried. Read Graham’s last comment. It really puts some perspective on the whole thing. Never… since the 11th June, 1967, has Israel been presented with the righteous opportunity to exercise total Sovereignty over every square inch of their 1948 delineated Jewish homeland….from the River to the Sea. There is absolutely no point in Netanyahu throwing a passing theatric hissy fit and dragging a couple of his Ambassadors home for a huff n’ puff chin wag. Far more productive….eternally productive, to have his Parliamentary draughtsmen immediately move to drawing up the required Sovereignty documentation, and have it through… and passed by the Knesset, ready for its immediate implementation on January 21, 2017….pending discussion with Trump….and to a lesser degree with Putin. Far cheaper for Bibi to do a couple of quick flights across the Atlantic to Trump Tower…than dragging three Ambassadors home. Sound like a crackpot idea…..not really – in the slightest! Requires just a modicum of the strength of conviction that Israel was initially built on in the 40’s. How many more brutal kicks in the cajones does Israel want, or need, to have inflicted on it’s self, before they say that that is enough. UNSC 2334 should have said that to Israel today!. UN Security Council 2334 is a G-d sense for Israel. Never was there a more opportune time in history for Jews and Israel, than right at this moment…. to finally take control of their own Sovereign destiny….while the surrounding Islamist ‘armies’….err sayages, are fully engaged with slaughtering each other….for regardless, they will be back in any case…. trying to slaughter Jews once they have their own charnel houses filled to capacity with either dead Shite, Sunni’s or Christians. Aside from negating the tiresome ‘Occupier’ rhetoric of Islamists, NGO’s and concerned Euro/Israeli Marxists, just’ how far would this go in also providing a happier inner glow for Mayor Ron of Tel Aviv, knowing his ‘beloved Israel’ – his words, is no longer an “Occupier” of Islamic lands….i.e. Israel. Graham you’ve missed your vocation. I love it! Thanks Graham. This made for wonderful reading with my morning coffee! Just thinking: The UN has become such a discredited organism, that it could be fairly called “Central Station for Human Rights Violators”. Decent countries should not want to be seen in that company any longer. What would it mean for Israel (and any other decent democratic country) to leave the UN ? It certainly doesn’t seem to bring it any advantages. It is past time for Israel to seize the diplomatic initiative and publicly apply the same “principles” inherent in the concept of “Palestinian lands” to those who voted in favor of this resolution. We now have a concept, with the Security Council’s blessing, that gives sovereign rights over territory to a “group” that had never exerted any sovereignty over it at any point in history, their rights arise (one assumes) as a result of residence and a self-proclaimed desire. So, Israel should start pushing New Zealand to recognize and vacate “Maori lands”, Spain to recognize and vacate “Catalan lands”, the U.K. to recognize and vacate “Northern Irish lands”, and the list can go on. This approach would recognize the justice of the concept of “two states for two people” and the principle that any previous treaty or legislation relating to these peoples’ status is void because they represent not the fair resolution of divergent views but the imbalance of political power between the two sides. The point is to take the offensive and expose these supposed principles as not universal expressions of anything, but one-off concepts to be applied only to Israel, and to make them the objects of derision for anyone interested in the stability of the international system. Stop shouting about double standards. Instead, pretend there is but one standard and start applying it publicly. Then, let the other side explain why they are exempt.